CF is a serious life-long condition, but the severity of the illness can vary greatly. The average life expectancy for someone with CF is about 35 years. Although, some with mild forms of CF can live to age 60 or beyond. CF is a genetic disorder. A child with CF inherits defective genes from each parent. Parents who have the gene, but do not have CF, are called carriers. 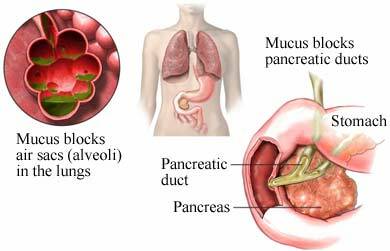 The abnormally thick mucus of CF blocks certain organs. This causes many of the symptoms of CF. Overall, girls are affected more severely than boys. You will be asked about your symptoms and medical history. A physical exam will be done. CF is suspected in a child with classic symptoms, especially if a sibling has CF. Tests may also be needed to check the pancreas. These tests may be done to assess symptoms or determine treatment. Hypertonic saline is a special type of salt water. A nebulizer machine creates a mist of this saline, which is inhaled. The mist may help thin out the mucus in the lungs. Chest percussion is rhythmic clapping over the chest. They may help clear mucus from airways. It is most helpful if done at least twice per day. Oxygen therapy may be required as the disease progresses. Ventilation may also be needed. Talk to your doctor about whether these are options for you. Surgery may be required to treat blockages in the intestine. Lung and liver transplants may also be considered. Support is important for those with CF and their families. Ask you doctor about local support groups or counseling options. If you have the defective genes, there is no way to prevent CF. Adults can be tested to see if they carry the genes before having children. Prenatal testing can determine if a baby will have CF. About cystic fibrosis: what you need to know. Cystic Fibrosis Foundation website. Available at: http://www.cff.org/AboutCF. Accessed February 12, 2018. Cystic fibrosis. Healthy Children—American Academy of Pediatrics website. Available at: https://www.healthychildren.org/English/health-issues/conditions/chronic/Pages/Cystic-Fibrosis.aspx. Updated November 21, 2015. Accessed February 12, 2018. Cystic fibrosis (CF). EBSCO DynaMed Plus website. Available at: http://www.dynamed.com/topics/dmp~AN~T116913/Cystic-fibrosis-CF . Updated January 8, 2018. Accessed February 12, 2018. Genetic testing. American Medical Association website. Available at: http://www.ama-assn.org/ama/pub/physician-resources/medical-science/genetics-molecular-medicine/related-policy-topics/genetic-testing.page. Accessed February 12, 2018. 4/16/2009 DynaMed Plus Systematic Literature Surveillance http://www.dynamed.com/topics/dmp~AN~T116913/Cystic-fibrosis-CF : Lai HJ, Shoff SM, Farrell PM, Wisconsin Cystic Fibrosis Neonatal Screening Group. Recovery of birth weight z score within 2 years of diagnosis is positively associated with pulmonary status at 6 years of age in children with cystic fibrosis. Pediatrics. 2009;123(2):714-722. 10/1/2013 DynaMed Plus Systematic Literature Surveillance http://www.dynamed.com/topics/dmp~AN~T116913/Cystic-fibrosis-CF : Elphick HE, Mallory G. Oxygen therapy for cystic fibrosis. Cochrane Database Syst Rev. 2013;7:CD003884.